Where: Myrtle Woldson Performing Arts Center, 211 E. Desmet Ave. Cost: April 25: $25/students; $50-$75/adults. April 27-28: $15/students; $25-$50/adults. Tickets available through www.gonzaga.edu.mwpac or by calling the box office at (509) 313-2787 from noon-5 p.m. Monday through Friday. April 28: Spring Jazz on the Plaza. Noon. Free. April 29: Gonzaga Symphony Orchestra featuring Young Artists’ Concerto/Aria Competition Winners. 7:30 p.m. $16/general admission; $13/students and seniors with ID; free/GU students and employees with ID. May 3-4: Annual Spring Dance Concert. 7:30 p.m. May 3 and 4; 2 p.m. May 4. $18-$28/adults; $10/ages 13 and younger; $13-$23/GU students and staff and non-GU students. May 5: Choral Collage Concert. 3 p.m. Free. May 5: Gonzaga Wind Ensemble. 7 p.m. Free; donations accepted. On the western edge of the Gonzaga University campus, near the Jundt Art Museum and St. Aloysius Church, a new addition years in the making is ready for its debut. The Myrtle Woldson Performing Arts Center, designed by the architecture firm Pfeiffer Partners of Los Angeles, with Bernardo-Will Architects of Spokane, was funded by a $55 million gift Woldson – a decades-long supporter of GU – gave to the university upon her death at the age of 104 in 2014. “The fact that, she was not an alum, she would decide this is where she wanted to basically place the legacy of her life and entrust that to our care, it’s an amazing thing,” President Thayne McCulloh said. During her lifetime, Woldson made donations to the Jundt Museum Art Endowment, athletics and student scholarships. She also donated to the school the Seattle waterfront property she owned, which will be developed into a 17-story high rise. The $55 million gift was divided into two parts: $30 million for the 52,000-square-foot performing arts center and $25 million for an endowment fund for scholarships. The logo of the performing arts center consists of three triangles that almost connect at a single point while pointing in three different directions. The logo alludes not only to the three purposes of the new building, which opens April 25, but also to the three communities it’s meant to serve. “We’re trying to involve all the different elements, the community, campus and Miss Woldson herself, into the building,” said Laura Sims, the center’s director. The main stage, which is named after former Gonzaga president and chancellor Father Bernard J. Coughlin, is a two-level, 759-seat theater and concert hall with a 50-foot wide stage. The carpet throughout the performing arts center, featuring a wavy pattern of blues and grays, is meant to evoke the Spokane River, a portion of which can be seen through the center’s floor-to-ceiling windows. Continuing the nature-inspired narrative, the walls of the theater are flanked by tree-like structures that reach up to the ceiling, which is covered in geometric panels that aid the theater’s acoustics while also recalling a canopy of vegetation. The center also boasts four dressing rooms, a wardrobe room, a furnished green room and two Steinway and Sons concert grand pianos. The main stage points toward the Spokane River and the Spokane community as a whole, a way to let the community know that the center is not just for GU students and staff. The Martin and Edwidge Woldson Recital Hall, named for Woldson’s parents, is a 168-seat hall which can be configured to act as performance and rehearsal space, a classroom or a location for non-performance events. Circles of light fixtures and acoustics paneling alternate on the ceiling, and a wall of floor-to-ceiling windows looks out onto campus, inviting the Gonzaga community to the center. One wall of the recital hall is made of panels that can be rotated to become a wall of mirrors for dance classes. Another classroom space in the performing arts center is a design studio with A/V equipment, theatrical lighting, work tables and flat-file storage. “We’ll use this for lab purposes then staff can work with the faculty to go on stage for practical applications,” Sims said. Finally, the Myrtle Woldson Collection honors the woman who made the performing arts center possible. This section of the center features informative panels and small displays that celebrate Woldson’s life, entrepreneurship and philanthropy as well as replicas of several rooms in Woldson’s home, complete with original furniture, art and decor. The Myrtle Woldson Collection, which faces Woldson’s South Hill home, will be open to the public 8 a.m.-5 p.m. Mondays through Fridays as well as performance days and times. 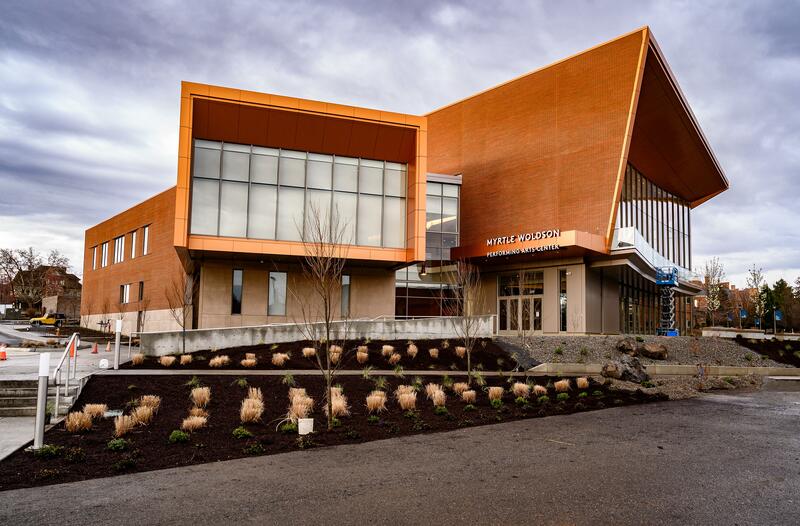 The Myrtle Woldson Performing Arts Center will hold its grand opening performance, “A New Season: A Celebration of Artistry, Place and Potential,” on April 25 through April 28, followed by a week of smaller concerts and performances from a variety of school groups. “A New Season” is Gonzaga through and through, the result of collaboration between more than 150 students and faculty in the theater, dance, choir and orchestra programs. After Woldson’s gift to the university was announced, Elisabeth Mermann-Jozwiak, dean of the college of arts and sciences, invited faculty to brainstorm what a grand opening production might look and sound like. Suzanne Ostersmith, assistant professor of theater and dance, and dance director, and Timothy Westerhaus, associate professor of music and director of choirs and vocal studies, began searching for a piece that would allow students in their respective programs to shine; they eventually selected British composer Alec Roth’s “A Time to Dance,” a cantata for choir and orchestra. Westerhaus sees the piece as highlighting the beauty of the Pacific Northwest and of the performing arts center itself, with an overarching message of love. “A New Season” is divided into four sections, each of which represents a season. Each section begins with students reciting poetry from poets including Tod Marshall, Beth Cooley and members of the GU Student Narrative and Poetry Society that references local landmarks to bring each season to life and also features a dance performance. The poem that opens the spring section, for instance, references the Spokane River and hiking at the Bowl and Pitcher in Riverside State Park. “Many think Spo-can’t, but we must choose to believe Spokane,” Power 2 the Poetry’s Bethany Montgomery said later in the section. The summer section features a soloist addressing the audience while a single dancer performs centerstage. Meanwhile, many of the other performers pose languidly across the stage as if the heat is just too much to bear. In the autumn section, performers hold up prop trees as others address the audience. Projections, scenery and lighting designed by Courtney Smith and costumes designed by Leslie Stamoolis, both assistant professors of theater and dance, help bring each season to life. On April 26, the cast will perform a matinee show for 675 Spokane-area elementary, middle and high school students, and a number of performers will travel with Ostersmith to Florence, Italy this summer to perform “A New Season” in venues throughout northern Italy. After rehearsing in the Magnuson Theatre, Ostersmith was thrilled to bring the production to the performing arts center for the first time earlier this month. The performing arts center will be the new home of main stage productions from GU’s theater and dance programs, including its October production of “Romeo and Juliet,” as well as concerts by the school’s symphony orchestra and choral and instrumental ensembles. But McCulloh, Ostersmith, Westerhaus and Sims also see the the Myrtle Woldson Performing Arts Center as an opportunity to bring a mix of beloved and up-and-coming artists to the region and collaborate with area organizations to host community events. “This should be something that elevates the performing arts for all of the Spokane area and beyond,” Westerhaus said. Beginning with the 2019-20 season, the performing arts center will host a series of 12 productions by nationally known music, dance and theater artists and companies. The lineup will be announced in the early summer, and tickets will be available for single shows and as discounted Flex Packages of four or more shows. The center will also be the home of the American College Dance Association Northwest Regional Conference in March 2020. “If that stage isn’t lit with light and performance, then it isn’t doing its job,” McCulloh said. Myrtle Woldson, born in Spokane, was the daughter of Martin and Edwidge Woldson. Martin, a native of Norway, owned the Northern Pacific Railway and worked as a railroad construction contractor. Edwidge was part of a large French family in Montana. Woldson soaked in as much as she could from her businessman father and eventually began buying and selling property and making investments of her own. A businesswoman, philanthropist and fan of the arts, Woldson donated $3 million in her father’s name to aid in the restoration of the Fox Theater, now called the Martin Woldson Theater at the Fox. In honor of her mother, with whom she shared her love of gardening, Woldson donated $1.2 million to help restore the Moore-Turner Heritage Garden. The Spokane Park Board voted in 2010 to rename Pioneer Park after Edwidge in recognition of Woldson’s donation. Though she didn’t attend the school, Woldson was a big fan of Gonzaga University and was often seen at campus events and cheering on the Bulldogs at basketball games. Woldson died April 11, 2014, at the age of 104.